Lawmaker defends law that keeps stores closed on Sundays so women can make their husbands breakfast in bed. For most, Sunday is hardly considered a "day of rest." While many spend Sunday catching up on work, preparing for the week ahead, or even—gasp!—relaxing, two representatives from North Dakota argued that women should be catering to their husbands on their day off. Lawmakers from North Dakota convened to discuss the state's Blue Laws— statewide laws that uphold a "religious standard" by requiring some businesses to open late on Sunday mornings and others to stay closed altogether. As most of the state completely shuts down on Sunday, many residents are asking for the archaic law to to repealed. Representatives Bernie Satrom and Vernon Laning defended the laws on very sexist grounds. Satrom argued that Sundays are for spending time with your husband, "making him breakfast, bringing it to him in bed and then after that go take your kids for a walk." Laning added that his wife has no problems spending his hard earned money six-and-a-half days a week, and he doesn't think it "hurts at all to have a half day off." Ah yes, the ol' "man work and make money, woman spend it" ideology. It is almost as archaic as these two fossils. What, are these two trying to give Donald Trump a run for his money? Repealing the Blue Laws would mean that people could shop on Sundays, but this men are somehow so sexist that they even reject the idea of their wives running errands if it means they won't be serving them pancakes. 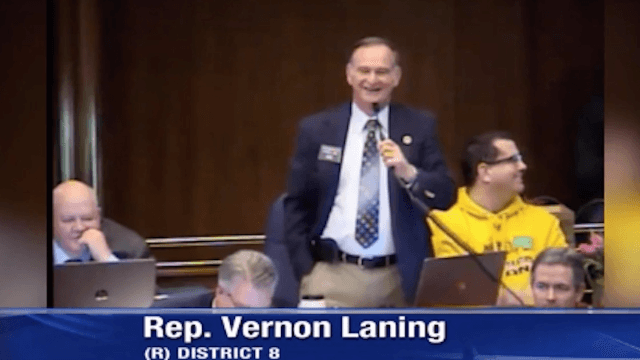 When Valley News Live contacted Laning about his comments, he argued that he was just telling a joke, and that and that anyone who is upset lacks a sense of humor. Hilarious. What's next? "Jokingly" telling a woman to make you a sandwich?